Financial Transactions Taxes (also known as Tobin taxes) are the fond friend of the banker-bashing left, believing that there are vast fortunes of money swirling around the ether that, if only they could take a tiny cut of it all, they could save the world. So the EU proposed one, and it has been getting introduced in 11 EU Member States. It appears to be failing to deliver ... and the Swedes would rightly say, having been there before, "told you so". Cyprus has a stay of execution, I say that because its banks will never be the same again. Indeed, if ever there was a case to allow full reserve banking (whereby loans = deposits, albeit with precious low returns if any), this is it. Cypriots will want banks that exist purely to protect their money from being stolen, not banks that risk just that. Allister Heath has pointed out that there are some good dimensions to this deal, it is a lot better than how it was looking a week or so ago. - All deposits of 100,000 Euro or less are safe. Given this was an ECB guarantee across the Eurozone, and the ECB has ensured this elsewhere, this was a minimum responsibility. It may not be the wisest promise, but it was that. This will, at least, mean that most Cypriots have their savings protected, although plenty of businesses will get hit. - As only two banks are in trouble (albeit two of the biggest ones), depositors for banks other than Laiki and the Bank of Cyprus, have their deposits untouched altogether. Good. It was a nonsense to effectively "nationalise" all bank deposits, including those of banks that are not having difficulty meeting their obligations. - Shareholders of Laiki bank lose the lot, and bondholders get their bonds replaced by equity, as low as that will be. - Taxpayers are no longer solely responsible for bailing out the banks, but rather there is an orderly wind down of Laiki back, with depositor accounts transferred to an inheritor bank - the Bank of Cyprus. In short, instead of a tax on all deposits, only depositors above the insured threshold of banks that need bailouts, get hit. - Actual deposit insurance is not being triggered, rather there is just an exemption for those under 100,000 Euros (and larger cuts for those above it). It saves taxpayers (as insurers), but it does disproportionately hit depositors when there is insurance that could be used to offset that. Still, the state shouldn't be insurer anyway. Allister Heath reckons it would have been better to wind down the banks completely, figure out a flat percentage of deposits across all accounts needed, and then used the insurance to recompense those under 100,000 Euros. - There still isn't a legal place for basic "safe" banks to operate outside the fractional reserve banking system economically. Many people would be happier, especially now, to have money sitting in a zero or near zero interest rate bank account that didn't face these risks. These events ought to have accommodated that. - Capital controls. I said enough about that yesterday. When removed, there will be grand capital flight. - With what is about to happen, it will kill off Cyprus being a financial hub for a generation. Just as well the country has good beaches and olives. Maybe it will think again about rejecting the UN brokered deal to reunify the country with the Turkish occupied north. That, along with Turkey being an obvious trading and investment partner (although the Greek Cypriot community may fear being overwhelmed), could help revitalise this country. Many will lose jobs and find themselves floundering as a result, but they will pick themselves up. - The rhetoric around "Russian money launderers" will haunt the EU and the ECB for many years. It is one thing to have concerns and beliefs, another to air them without presenting evidence and without taking regulatory steps to address them. To sweepingly act as if Russians with money in Cypriot bank accounts are all criminals is an unwarranted slur. If there is substance in this, and the ECB cares, then there should be Eurozone wide directives to cover this. - Cypriot public debt will be at 100% of GDP by 2020 at best, given it is borrowing 10 billion Euro from the Eurozone to cover all of this. - Cyprus has agreed to increase corporation tax to 12.5%, reducing its competitiveness. 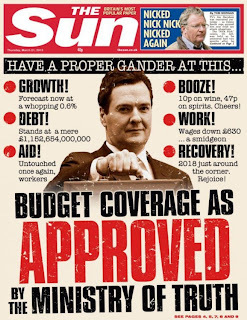 "An economic and political disgrace" is how City AM editor, Allister Heath, describes it. Capital controls, a euphemism for banning you from taking more than a sliver of your property out of a particular country. They are motivated by concerns over the "public good", over "the long term stability of the economy", when in fact the mere fact of introducing them speaks volumes about the latter, and is contrary to the former. It is the logical end point of the moral turpitude of statists, whose fundamental belief is that private property, really, doesn't exist, but is tolerated and can be confiscated, controlled and shared as long as it fits the big picture, the grand plan. The plans of politicians who think they know best how to run your life. Cyprus has no future as a financial hub. Confidence is utterly destroyed, as depositors, regardless of whether they individually will lose part of their savings as part of the bailout, will abandon its banks. It's over. Runs on banks happen because people panic about their property and their savings. That money is their's, and they frequently worked hard and took time to make that money. They rightfully seek to protect it, withdrawing it from institutions that might take it from them, because money is an extension of the self. It is the product of people's minds and labour, translated into a universal medium of exchange, and a means of storing that value. Being able to take it out of a country is an extension of the right to leave, the right to take your life includes taking your possessions, includes your bank account. Of course, banks are not foolproof. In a free market, people rightfully take a risk in deposits with banks, particularly given virtually all banks engage in fractional reserve banking, lending much more than they take in deposits. If a bank fails, then depositors should become unsecured creditors effectively being a segment of the new shareholders of the bank. However, it is quite another thing for a sovereign state to do this, to restrict ALL capital flows out of a country. You see the primary reason why a government does that is because it knows it has lost the confidence of its people, because it is about to steal from them in one way or another (in this case not through devaluation/QE of the kind propounded by Paul Krugman, Russel Norman and Robert Mugabe). It is a sign of failure, the tool of the statist and the act of a scoundrel. The UK Leader of the Opposition is empty. His One Nation rhetoric is the antithesis of what he offers, which is a vision of "them" (the rich, which curiously excludes himself) and "us" (people on welfare, people working for government). The man who offers envy, class hatred, regulation of private enterprise and more state housing to an economy lumbered by public debt that he denies is the fault of his very party when it was in power. The man who uses terms of utter lies, like "bedroom tax" (there isn't one) and "tax cut for millionaires" (there isn't one, there isn't a tax on wealth), and fuels disdain and anger against entrepreneurs, private enterprise and success, by pandering to beneficiaries and state employees. This is my go at summarising this. Obviously, if someone spots something fundamentally wrong with my analysis, please leave a comment. I don't profess to be an expert on the Cypriot financial sector. Cyprus took a light regulatory touch to financial services, so its sector grew. It gained a reputation for providing only the minimum level of scrutiny needed to comply with European banking rules, hence it tended to attract substantial deposits from Russians keen to keep their money away from Russian authorities. Cypriot banks grew from this, but invested heavily in Greek public debt as a “safe” investment. Greece approached bankruptcy, and the Eurozone (Germany) and Greece agreed on a bailout plan that meant its bond holder (those who lent money to the Greek government) would take approximately a 50% cut in their bonds. This shared the burden between Greek taxpayers and Greece’s creditors. Cypriot banks have been hit by this “haircut” in their investments, effectively being on the edge of folding without ongoing liquidity support. The ECB is willing to provide some of this, but is demanding that investors in Cypriot banks take their share. However, Cypriot banks issued few bonds, so simply demanding Cypriot bondholders take a cut wouldn’t be enough. So the suggestion was made to take a cut from those who loaned money directly to Cypriot banks – in the form of depositors. This runs contrary to the pan-Eurozone guarantee for depositors up to 100,000 Euros. The reason given for wanting to confiscate Cypriot depositors is because “most of them are Russian” and “we don’t know where their money came from”. Concerns that never translated into legal action, and which are at worst racist suspicions. So now the Cypriot government faces its financial system collapsing. It is happening now because the previous, communist led, government kept its head in the sand until the election it knew it would lose. The Cypriot government itself does not have high public debt or a serious budget deficit. It is not due to rampant overspending, but rather a banking sector that can’t cope with the bailout package for Greece demanding it write off substantial assets. The Cypriot government is looking to the Russian government to save it, which from the ECB’s point of view means it wouldn’t be willing to provide ongoing liquidity, which means a real risk of a Euro exit, unless Russian support is substantial indeed (to the point where Russia would be the central banker for Cyprus, just think about that for a moment). To get ECB support, it needs to find money from somewhere and could get it from a levy on deposits over 100,000 Euro. If no solution is obtained by Monday and the ECB stops providing liquidity, Cypriot banks will collapse and the Cypriot government may choose to print its own currency to cover spending, meaning a disorderly exit from the Euro by a country that – in itself – did not have a budget. Cyprus’s financial sector is finished, regardless of what happens. Local and foreign depositors wont trust its banks in most scenarios. 1. If Russia saves Cyprus, and it remains in the Euro, then it will likely mean a substantial withdrawal of deposits from Cypriot banks. They will shrink, and Cyprus will have a bunch of effectively Russian owned banks operating within the Euro. It is hard to see the ECB being willing to support this. 2. If Russia saves Cyprus, and it is forced to exit the Euro, then Cyprus will have a nearly worthless local fiat currency that does far more harm to depositors than a levy on Euro deposits. It is over for Cyprus’s financial sector, but it will become remarkably cheap to holiday and buy land in Cyprus. 3. If the ECB saves Cyprus, along with Russia (providing the Cypriot share), then Cyprus will have a shrinking financial sector. Russians will be looking elsewhere to put their money. 4. If the ECB saves Cyprus, with a bank deposit levy, then Cyprus will see a massive run on its banks, and the financial sector will be effectively finished. 5. If neither the ECB nor Russia bail out Cyprus, the banks will default, depositors may lose most of their money, it will be forced out of the Euro, and faces considerable civil unrest. - Greece, for being fiscally incontinent and being unable to pay back its debts. - The Eurozone, for being unwilling to guarantee to Cypriot depositors what they guarantee to other Eurozone depositors, on grounds that it was never willing to address in the past. - Cypriot depositors, for trusting the Eurozone and its government to ensure they avoid moral hazard. - Authors of the Euro, for not anticipating the inevitable credit bubbles a pan-economic fiat currency, driven by German economic performance, would fuel. Monday. The Cypriot Parliament and the ECB. My bet is that Cypriots will be dealing entirely in cash in a week's time (they already increasingly are). The Prodigal Greek has a great summary of the measures taken or soon to be taken, that will ensure this. I loathe Earth Hour. I called it "onanistic vileness" or rather the act of utter wankers who have the luxury to claim moral superiority, because they can stop using electricity. Oh yes, the sheeple in the relatively free rich world (and even the relatively unfree middle income world like China) will have a jolly ol' time switching off our lights for an hour. Makes you feel better a bit of enforced poverty doesn't it? Earth Hour presents the disturbing spectacle of people celebrating those lights being extinguished. Its call for people to renounce energy and to rejoice at darkened skyscrapers makes its real meaning unmistakably clear: Earth Hour symbolizes the renunciation of industrial civilization. I've seen a city that has a constant earth hour - Pyongyang. Dark, with lights in a few buildings, focused on the grotesque statues of the city's past Big Brothers, on the railway station and one or two other pockets of light. It is dismal and dire. To celebrate replicating this is unspeakably wrong. Pity those who have no choice but to "celebrate Earth Hour". Donate to LiNK - Liberty in North Korea. Help people fleeing the darkness to experience light, heat and civilisation. Otherwise, keep the lights on or maybe go for a drive. Celebrate that a century ago, electric lighting was a delight, for being safer, brighter and opening up the evenings to more socialising, to reading, to enjoying more of life. Celebrate that today, electric lighting is more reliable, safer and uses less electricity than ever before. The future is not with those who would turn the lights out. I don't usually, but this is almost a work of art. 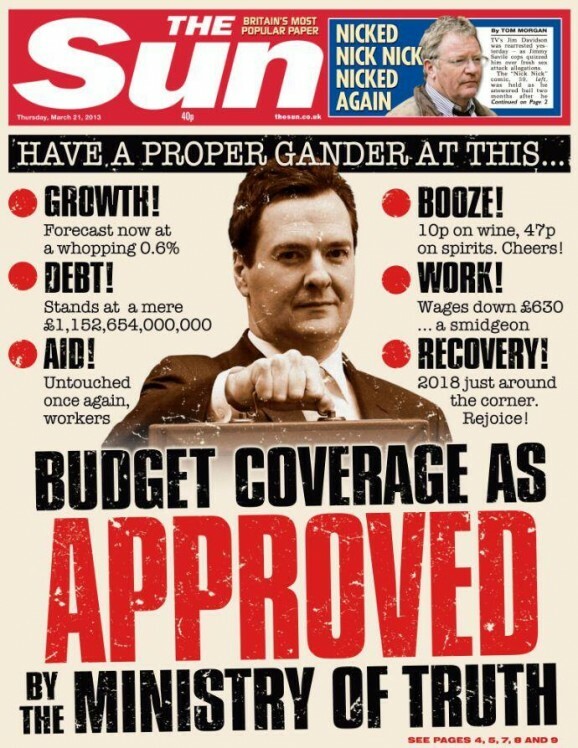 A damning indictment on a government that has failed to do enough for the economy, and is seeking to regulate the press. Commentary and sarcasm that is all too clear. I wanted this being big tax cuts, funded by a serious capping on the welfare state, cutting of wasteful state spending and bureaucracies, supported by some privatisation. Small tax cuts on companies and on beer, a worthwhile increase in the income tax free threshold to £10k. Small tax increases on other alcoholic drinks, owning a car, catching a flight and elimination of some tax credits and a mini Fanny Mae type mortgage guarantee scheme, and subsidised loans for home buyers. There were some new exemptions on climate change obligations for some sectors, which is promising. Overall, nothing much to see at all. Public debt growing to close to 100%, budget deficit at levels higher than any OECD country and economic growth forecast to only be 0.6%. No, the Conservatives wont be winning in 2015 at this rate, and no Labour offers nothing more than a bit more borrowing and a bit more money thrown at public housing and railway projects. Yes, I have had enough of maintaining a dual existence in one place. I have decided to put all of my writings on UK politics in one place, largely because that is where much of my focus now is. Of course I am still following New Zealand politics and will write on them, and more widely here. I will also still post short links to the UK posts here, but will not be clogging this up with UK focused material that NZ and other readers are uninterested in. I simply couldn't go from writing about north Korea, then the NHS to whether Auckland should have an underground railway and think I had a consistency of target audience there! So please go visit. My latest post is on the cross-party agreement on press regulation in the UK, and the excellent editorial by City AM Editor Allister Heath, who is the UK's best and only libertarian newspaper editor. Even if you are not interested in business and financial news, reading his editorial every day is a warm reminder that belief in capitalism, free markets and freedom more broadly, is not just held by a few. - "Freedom, ultimately is indivisible; the only reason why regulation of the media didn't happen any sooner was because newspapers were too influential. Now that their power is waning, they are fair game, like everything and everybody else". One of the claims constantly touted by enthusiasts of the European Union is the much exaggerated claim that the EU and its predecessors "kept the peace in Europe" after two major wars. There is an element of truth in that, simply because countries and people that trade more, travel more and do business with each other in ever increasing frequency, are less likely to tolerate the sort of mindless aggressive nationalism that is the hallmark of so much war. There can be little doubt that free trade and movement of people and goods within the EU is good for that (although overwhelmingly it was NATO that has kept the peace in Europe, and both it and the EU failed demonstrably to do this in the former Yugoslavia in the 1990s). That peace prize is looking a bit fractious, as the actions over Cyprus in the past few days have indicated. Let's be clear, I think taxation is legalised theft, in any case. More insidious is the legalised theft of state sanctioned inflation and regulated interest rates, which are currently effectively stealing savings from the public in the UK. 13% of the value of Pound Sterling has been eroded in the UK alone, by inflation, about double that if you compare it to the US$. The British Labour Party and Liberal Democrats both believe in a wealth tax, taking money from you because you own a particular asset over a set value. Now the EU, having promised that the first 100,000 Euros of deposits of everyone's bank accounts are protected by government deposit insurance, is going back on that and pushing for the confiscation of 6.7% of bank accounts located in Cyprus up to 100,000, and 9.9% on deposits above that. Consider what you would do if that happened to you. You'd be angry, very angry, and some of that anger might be directed towards whoever you thought was responsible. Banks, officials, politicians. The wealth tax is to bail out the Cypriot banks, which overextended themselves, particularly being used by many larger depositors from Russia seeking to avoid scrutiny over transactions that may be illegal in other jurisdictions. Of course the real answer to this would be to led the banks fail, then the deposit insurance scheme would kick in and those with deposits over 100,000 Euros would lose it all. Which is the right thing to do. However, the problem is that Germany, indeed the Eurozone believe it must bail out banks within the Eurozone. This effort is a clumsy attempt to put some of the cost upon Cypriots, especially clumsy because it is unique to Cyprus (Greek, Spanish, Portuguese and Irish depositors haven't had to pay), and because it sets a new precedent. Who now believes bank deposits are safe in Greek (who believed it before? ), Spanish, Portuguese or Italian banks? There is ever chance of a run on bank deposits in some if not all of those countries, and in the Euro itself, putting those banks in jeopardy and devaluing the Euro some more. One claim is that the basis for this proposal was that Cyprus didn't want to upset Russia, by letting the banks fail or claiming the bailout by a far larger clawback from large depositors. I doubt whether Russian depositors will be trusting Cypriot banks from now on in any case. A run on the banks will expose not only the lack of liquidity in banks to give you back your money, but the inherent risk in fractional reserve banking. That being that banks issue credit for which they have no deposits, to an order of several times the value of deposits. When those borrowers can no longer repay their debts, consider how that affects your ability to recover your deposits. The law of unintended consequences may unravel in the coming days, as banks in the Eurozone periphery start to see a panic appear, as people start to take out their savings, in fear Greece, Italy, Spain or Portugal could be next, or Ireland. Once people see queues at banks in those countries, they will join them, and there will be a snowball effect. Their own national politicians may not be trusted, certainly the ones in Brussels wont be. The more they get told it wont happen to them, the more they will point at Cyprus and say "actually myself and my family are more important than your empty promises", the more it will get worse and worse. I believe the only way this can be stemmed is either to honour the 100,000 Euro deposit guarantee (and slam deposits above that level), or for Cypriot citizens to be guaranteed that amount alone (leaving foreign holders of accounts to take the hit). The price for that would be paid by Eurozone taxpayers elsewhere, and I'll let them decide how to treat the politicians who decide better to thieve from northern Europeans than from southern Europeans. There is only so much of this Germans will take as perpetual penance for a war that most of them were born after. Resolution of this issue must happen within the next day or so. Imaginations will wander, rightfully, after that. Bear in mind Italy doesn't have a government. Otherwise it becomes unthinkable. Long lines of Europeans outside banks that close due to running out of banknotes, a general public becoming anxious that their savings are inaccessible. How long before a brick is thrown, or a firearm brandished, and people demand access to vaults and safes? In other words, how long before the average, law abiding, middle income citizen discovers what an abject fraud it is to trust their politicians, and those in Brussels to look after them, rather than to protect people from failure? Meanwhile, the damage is done to Cypriot banking. Who now would place a deposit into a Cypriot bank? What Cypriot is taking a cheque or cash and putting it into a local bank? How many Cypriots are now changing their future banking arrangements to banks elsewhere (and how many are not in a position to readily do so?)? Stepping back, how's that protection of peace in Europe looking now, when a small but sizeable proportion of Greeks embrace fascism it is easy to ignore, but when confidence in the Eurozone banking system plummets, does Brussels have reason to continue to prance about with this hubris about all the good that it has done? UPDATE: The Cypriot Parliament, which must vote on this law, wont do so until Friday. Cypriot banks will remain closed until then. Will this trigger panic more widely? What would you do? For all of the hand-wringing and gnashing of teeth of the National-led Government's minority sale of a bunch of companies that have private competitors, you'd think that Labour, the Greens and NZ First would actually be holding the stop sign against the government selling ANY businesses at all. Given the referendum, the claims that part-privatisation is anti-democratic and other hyperboles about the programme, you'd think if you believe in the state ownership of the means of production, distribution and exchange like any socialist, you would want to stop the shrinkage of the state by all means. The people (through the state) ought to own more and more enterprises according to any socialist, and the mere fact there is an undercurrent of "should we promise to buy them back" tells you how reactionary Marxist the NZ left has become. So you might think. However, I think they don't really give a damn, it's all about publicity and xenophobia. For what is about to happen is no different, indeed this will be the first full privatisation by a New Zealand Government since the 1990s. This little piece of news has received no comment from the Opposition at all, presumably because it is a government owned company that is doing the privatisation. Kordia, which was once BCL, which was once a subsidiary of TVNZ and owns most of the TV and FM radio broadcast transmission sites in the country, is selling the ISP Orcon. Orcon is in a vigorously competitive market, like Mighty River Power. It sells services to end users, like the power companies. However, as Kordia is selling it, it isn't up to Ministers, so there is little political capital to be gained from opposing it, unless the Opposition wants to abolish the SOE model - which would mean it could never argue it wants to own businesses to make money for taxpayers, but rather go back to the politically directed approach of the age of Muldoon. Yet I think there isn't even remotely that kind of coherence in the Opposition to partial privatisation. To the left he was a hero, a democratically elected socialist who used the oil wealth of his country to lift the very poor out of poverty and give millions a chance, up against criticism by "vested interests" who continued to tout capitalism as the answer. To some on the right he was a communist dictator, who seized power and was running Venezuela like Zimbabwe. Despite a skewed electoral system, monstrous control of the media and bullying and intimidation of the opposition, it would be churlish to deny that Hugo Chavez had many supporters. He did get elected, and it isn't hard to see why many people, granted handouts from the state, wouldn't be grateful. When oil prices were at their peak, he used the money to pay for medical centres, welfare benefits, creating civil service "jobs" and infrastructure in poorer neighbourhoods. 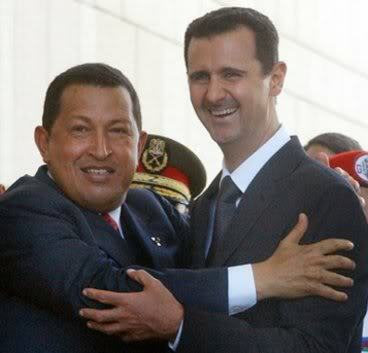 While it is easy to pour scorn on all of this as being vote buying, it really is little different from what leftwing parties do in Western democracies, except Chavez did have money flowing in from the state oil companies. He didn't need to tax the wealthy. In that respect, it's understandable why some would think he was relatively benign, bearing in mind that other oil rich countries either keep the money largely within a tight ruling elite (Saudi Arabia, Equatorial Guinea) or put it away into a rainy day fund to pay for pensions (Norway). Yes he did spend the oil wealth of the country on massive welfare programmes, but he also spent it on subsidising Cuba's faltering economy, he spent it on arms and he even gave it to London, in the form of subsidised diesel for London buses, as part of a deal with then Mayor Ken Livingstone. The moral compass of both men gets tested when money that should have been for Venezuelans is transferred to one of the wealthiest cities in the world. His economic legacy was characterised by the most fundamental error common to almost the entire left - complete neglect of the creation of wealth and an obsession with spending it. His social legacy is that of an authoritarian state increasingly based on obedience and deference, with violence used against those who dared oppose it. It includes one of the highest murder and kidnapping rates in Latin America, with over 21,000 a year (an average of 75 per 100,000 people, compared to 4.8 in the USA), including 300 in the first half year in prisons alone. It was 4450 in 1998, the year before Chavez gained power. How that matches with claims by the left that poverty causes murder is unclear. The regime banned private purchases of firearms a few months ago, which of course has had no effect, which given the number of illegal firearms is estimated at between 1.6 and 4.1 million, is unsurprising. However, if you were Venezuelan would you trust the state to protect your rights? Had anyone said a week or so ago that ex.NBA basketball player Dennis Rodman would be hugging Kim Jong Un, all North Korea watchers would be thought it absurd. Now I'm not going to go into what Rodman said, Curtis Melvin's blog - North Korea Economy Watch - has the best coverage, and you should watch George Stephanopoulos's interview with him, where he takes on Rodman talking about Kim Il Sung and Kim Jong Il being "great man" and slips into moral relativism. Rodman is at best naive, and at worst a willing idiot for a despot. If he reads the Human Rights Watch report, accepts it and visits Kim Jong Un again to discuss it, then he truly will have made a breakthrough unheard of before. However, what it looks like is a young dictator happy to accept a childhood hero. Kim Jong Un loves basketball, probably from his days from being schooled in Switzerland (unlike his father and grandfather, he has not been raised away from the West). He's just pleased to have such fun, although he will probably have been made aware of the political significance of the move. For a start it makes the Democratic People's Republic of Korea (DPRK) look cuddly and friendly, and Rodman has been an almost perfect diplomat, for the DPRK, in making the place look detoxified, somewhat. The hope is it will put pressure on the Obama Administration to talk, shown by Rodman saying Kim Jong Un just wants Obama to "call him". Seems simple right, but it is what the DPRK has wanted since 1953, it wants to sideline the Republic of Korea (ROK) in Seoul, which it considers to be illegitimate, and negotiate directly with the US, which it constantly claims as occupying south Korea. 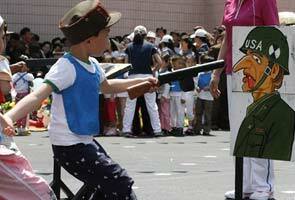 Of course, Kim Jong Un knows this to be a nonsense, but the Kim regime's priority has always been to one-up the ROK. Obama calling Kim Jong Un, weeks after the people of the ROK elected a new President - a woman no less - would be a huge snub to her. A core component of US policy (and indeed Japanese and dare I say Chinese policy) is for the two Koreas to talk to each other. The US role is to maintain a military deterrent (including nuclear) against the DPRK, as the ROK does not have chemical, biological or nuclear weapons (the DPRK has all of those). So that wont happen. Obama wont be calling Kim Jong Un. The more curious element is the image above. The DPRK is fervently racist, as described by Brian Myers in this book (although I disagree with some elements of it), with Koreans thinking they are pure and clean. The regime has forced women who bear children of Chinese men to abort, it looks down upon non-Koreans, and has countless images depicting Americans as hooked nosed and dirty (reminiscent of how the Nazis portrayed Jews). The idea that an African-American could touch, let alone hug a leader of the DPRK is utterly unprecedented. The extent to which that image is disseminated in the DPRK is unclear (most north Koreans don't get television, as they don't get reliable electricity outside Pyongyang, so they will get reports from radio and newspapers). However, while Kim Il Sung shook the hands of umpteen African dictators, the embrace given to an American sportsman would have been absurd (although he did meet Jimmy Carter and Billy Graham, they are hardly of the same ilk). 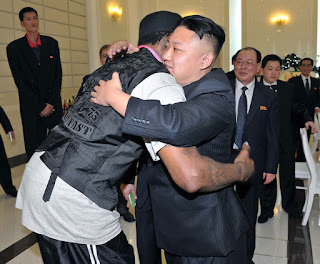 Perhaps Kim Jong Un thinks that Obama will listen to Rodman, because of racial brotherhood? It seems a little absurd, but from a Pyongyang perspective could it be a factor? I don't think what has just happened in Pyongyang is significant from a diplomatic point of view, I think it shows a young dictator having fun. One who wants the outside world to come, on his terms, and wants to be noticed. Just as noticeable is the significant boost to tourism, as there has been a dramatic increase in tours to the country. That's a good thing, as the more exposure locals get to foreigners the better. My hope is that if Rodman does go back, he can deliver a message from the US and ROK administrations (and he should visit the south before he visits the north again), which is one of wanting to defuse tensions and to encourage the north to actually open up and reform. Bear in mind that absolutely nothing else has worked in the 21 years since the end of the Cold War, and it would morally wrong and futile to continue the endless cycle of talks, bribery, DPRK lashes out, sanctions, talks.